What food kids need to eat to stay in top form, healthy, strong and smart, at the same time easy to make to match up with current fast paced lifestyle?. A question very often parents ask other parents and search over and over again on internet. Even then most parents end up feeding their children unhealthy food unknowingly. Parents, many a times get carried away by clever advertising terms like “Reduced fat” “Enriched” flour, “Multigrain”, Whole Fruit” and many more. Sure, those sound healthy, but the poor nutrient quality of these foods has been smartly obscured. These foods in reality could be doing far more harm to child’s health than good. Oatmeal for sure is a great food for kids. They are packed with fibers and nutrients. Nutrient-rich oatmeal contains thiamin, magnesium, phosphorus, zinc, manganese, selenium, and iron. But quick-cooking oats or instant oats are not that good for health. Instant oats are basically powdered oats and take less than 5 minutes to cook. Although they are easy to cook, most brands of instant oatmeal have added salt and sugar. Also a 250 g serving of instant oatmeal lead to a GI of 83, whereas coarse one can be as low as 55. The process of grinding oats removes some of their fiber content, which accelerates digestion and raises the instant oats GI. 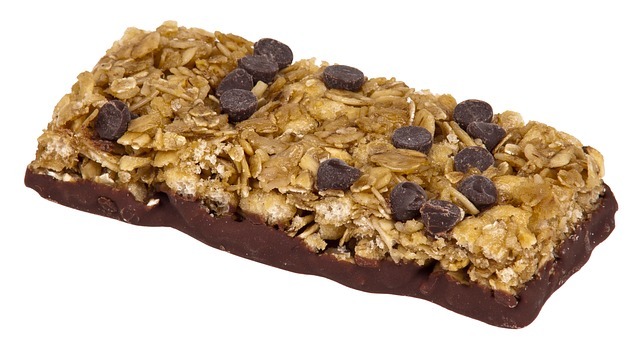 The word granola may invoke thoughts of healthy oats, grains, and nuts all nicely mixed up into an easy to eat bar. Many parents proudly give this energy packed bars as evening snacks. But parents beware- what lies behind the wrappers of these seemingly innocent bars may be an over-processed nutritional mess. Similar to candy or cakes, many of the bars contain high fructose corn syrup, which has been linked to weight gain and insulin resistance. It also might contain hydrogenated oils, which can raise cholesterol levels and monosodium glutamate, which has been linked to stomach problems, obesity and type 2 diabetes. Through advertisements and marketing we have been made to believe that breakfast cereal is indeed a part of a balanced breakfast. The nutrition label too carry phrases, such as whole grain, natural, fortified with vitamins, gluten free and high in fiber – all keywords that give consumers the impression that cereals are healthy. The reality is far from the truth. The grains are first made into fine flour and cooked, after which sugar, flavor, color and other additives are added. Then they go through extrusion process, after which they are dried and made into different shapes. During this process, fiber and nutrient value of grain is partially lost. 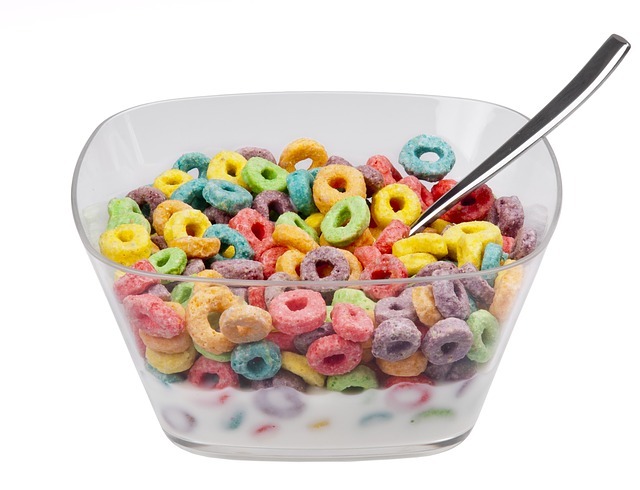 Breakfast cereals made for kids many a times have 85% more sugar, 65% less fiber and 60% more sodium than cereals marketed to adults. Unless one opts for organic cereal, it’s likely to contain genetically modified ingredients (GMOs), including wheat, corn and soy, which can wreak havoc on the immune system and lead to various health issues. Select Cereal boxes with short ingredient list (added vitamins and minerals are okay). Choose Cereals with high fiber content. Many people think that having a tetra pak of juice is equivalent to eating fresh fruit. This is not correct. Fruit juice which comes in packs rarely contain fiber and mostly is just a concentrated source of sugar. Fruit juice elevates blood sugar more quickly than whole fruit, and the level of sugar that can be obtained from fruit juice is higher than the level found in whole fruit. For example, 120 calories’ worth of whole apples contains about 24 grams of sugar, while 120 calories’ worth of apple juice contains about 30 grams. 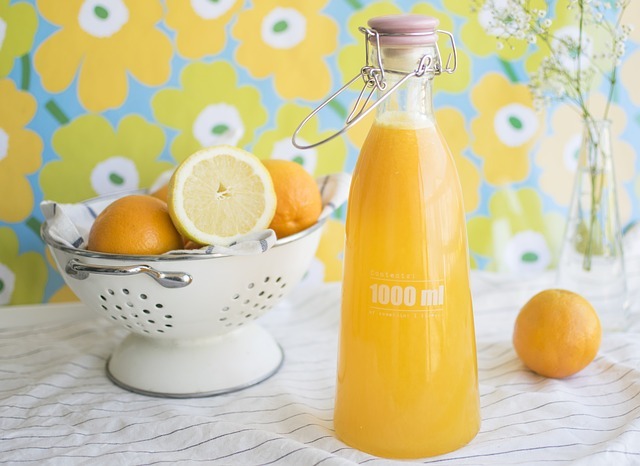 Many a times fruit juices that are sold in supermarkets contain only a small percentage of real fruit juice, and contain added sweeteners (sucrose or high fructose corn syrup). As a result, children end up consuming large amount of calories without getting any actual nutrition. In addition these juices are loaded with Nature-Identical and Artificial Flavoring Substances, Acidity regulator (INS 300), Antioxidants (INS 300) etc. Artificial flavors and additives are added to juices which can harm the teeth and intestines. It is found that the juice concentrate is actually made oxygen less to increase its longevity. This hampers the taste and so additives and artificial flavoring agents are added to make it taste like the real fruit. Yogurt is a terrific food for kids and adults alike. It is an excellent source of calcium and potassium and probiotics. But most of the “kid-friendly” yogurts deliver in addition to nutrients, a hefty dose of added sugars and artificial colors. Many of them contain in addition preservatives, thickeners and other additives. Pick one pack of kid’s yogurt and mix it half and half with plain, unsweetened yogurt. Get them used to home made plain yogurt sweetened with fruit, a teaspoon of sugar or a teaspoon of honey. There is nothing to replace home cooked food made using fresh vegetables and pulses. But then in this fast paced life, many a times it’s not possible. So before you pick up your groceries, check on the ingredients and make your choices wisely……Give your kid ‘Healthy’food. I don’t think anything instant is good for anyone. And you’ve rightly put it a lot of products may seem healthy but they are loaded with sugar. Great infomation on the part of health and healthy food. We never know what these ready made instant food has inside in their packs. So it’s better to stay away from these and go for original diet only. This post is quite alarming. I give puffed cereal to my daughter. By now I wil not. Yes we many time thiks this is right but we need to analyse the aspect is all directions. especially if it is with our kids. Thanks for sharing this post. I keep reading about the how processed food is not good for kids. Your post is very informative indeed. Do you think organic ones are equally harmful? These all look so yummy and tempting. Thanks for sharing this detailed information. Thank You so much for sharing such fruitful insights Hena, I was shocked reading about Granola Bars & Cereals actually. Lovely post will share with my friends to make them aware too. To be honest I don’t like Instant oatmeal … I prefer to make fruit juice and curd at home. But yes this post really helpful for those who have a kid like me. Thanks for sharing. Finally someone said it. I don’t eat now so we have these enter our homes.Loved this. We are increasingly falling prey to the clever advertising. Most processed foods are bad for us and kids, equally! Nice tips on helping parents to give a truly balanced and healthy diet to kids. It helped bust several myths I had. I love the name science and samosa! This is an excellent post and a very relevant article! Often what we assume is healthy too is just for show. This post is an eye opener and most of these products says are not that true. It is always best to give home made foods to kids. What is Clean Eating ? How to begin Eating Clean ?